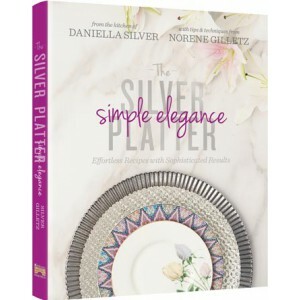 Daniella Silver, author of the bestselling The Silver Platter: Simple to Spectacular, once again teams up with Norene Gilletz - the acclaimed "matriarch of kosher cooking" - to bring a whole new level of elegance to our tables. Simple Elegance offers Daniella's many devoted fans food that is as beautiful to look at as it is healthy to eat. The food is magnificent and, surprisingly, oh-so-simple to prepare. So what is the secret of "simple elegance"? It's not about dozens of hard-to-find ingredients, pricey equipment, and complicated instructions. It's simply about paying attention to the small details - an unusual garnish, an unexpected ingredient, a touch of flair in presentation. A little thought, a little imagination, and a lot of caring - and you've created a stunning dish, in less time than you would have believed possible. From creative appetizers through gorgeous main dishes and show-stopping desserts - all the recipes feature accessible ingredients, easy-to-follow instructions, make-ahead and freezing tips, nutritional analysis, and mouth-watering photographs to ignite your imagination. Elegance - it's a way to show your care and love for those eating at your table, as you serve them beautifully presented food. Simplicity is how we can survive, and thrive, in today's hurried, busy world. Put them together - as Daniella and Norene do in this ground-breaking cookbook - and you have the perfect cookbook for our homes. For our lives. And for the people we love. Over 160 recipes: Wholesome. Easy to prepare. And gorgeous to serve! Stunning photo with each recipe Norene's Notes: Every recipe includes techniques, tips, and advice from bestselling cookbook author Norene Gilletz Each dish indicates if it's freezer-friendly for make-ahead cooking Full nutritional analysis for every recipe Many gluten-free options, perfect also for Passover cooking!